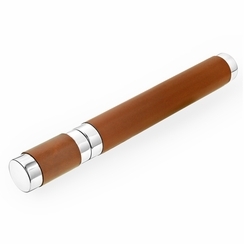 This brown leather covered stainless steel cigar holder will keep your smokes personal and safe. With its strong build quality you can be sure that your cigar will remain fresh and ready to be enjoyed at anytime. Engrave the cigar tube cap with a name or initials to make it a personalized gift for that someone special. Our personalized cigar tubes and engraved cigarette cases will keep your smokes in perfect condition while maintaining a look of sophistication and class.